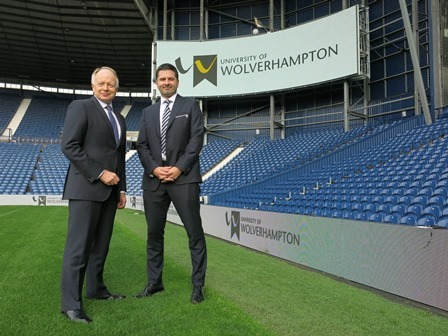 The University of Wolverhampton has announced a new two-year sponsorship deal with West Bromwich Albion. The deal extends the partnership between the Premier League Club and the University which was first launched in 2013. It will mean the University will continue to be the Club’s official Higher Education partner. The University will receive LED and big screen advertising at The Hawthorns, joint social media promotions, promotion across the Club’s fast-growing digital media channels, a hospitality package for key matches and a West Bromwich Albion presence at University open days. The deal aims to develop internship and work placement opportunities for University of Wolverhampton students across several departments at the Club. It will also explore potential business development opportunities between the University, Club and its ownership group and collaborative developments with the University’s Institute of Sport. Professor Ian Oakes, Deputy Vice-Chancellor of the University of Wolverhampton, said: “We are delighted to be extending our sponsorship with a key partner in West Bromwich Albion. “The Club has firmly established itself in the Premier League and like the University has built up a strong reputation and brand profile in the UK and internationally and is very ambitious. “As the University of Opportunity we are extremely pleased that this agreement will lead to work experience, placement and internship opportunities for our students and graduates. It will give them vital insight into how a multi-million pound business works and enhance their skills and experience.